Is the fact that your car is never going to run again getting you down? Or is the vehicle in question a Ute, van, SUV or 4wd truck? Has the vehicle in question been banished to a dark corner of your property in an effort to forget about it for the time being? If this is the case, it is still using up a certain amount of your residence that can be used for better things. Perhaps the reason for its current state is the fact that the years have had their toll on it. Maybe it became the victim of some seriously bad luck, and a major part blew. Was it in a road accident? Any one of these circumstances will end up with you wanting to scrap your car. And you will have no problem selling it if you sell to us here at WreckMonster. You can easily get in touch with us by calling this number: 0401 333 393. 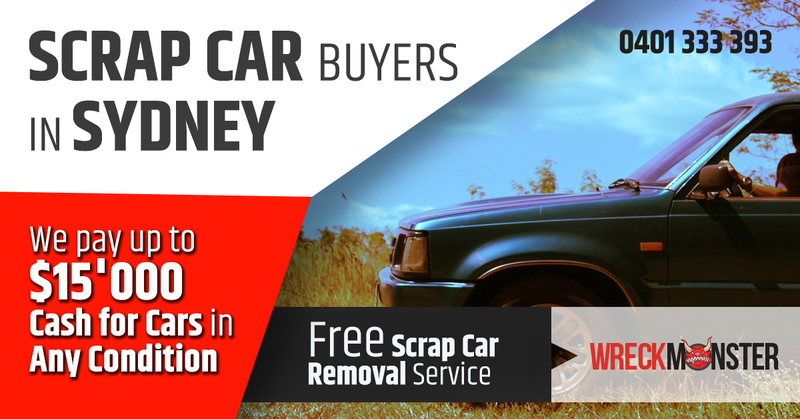 The best deal for your scrap car is only a mere phone call away. Or fill out a form on our website. Totalled in Accident or unwanted. Also, a lot of cash for cars companies take part in the practice of somehow making their customers pay for them to remove the car from their property. This can be done by simply paying less money for it. This is known as a hidden charge. However, there are some Auto Removal Companies that won’t even provide removal to begin with. They will tell you to make the arrangements to remove your old car yourself. This only ends up with the customer ultimately getting less money. However, here at WreckMonster, we have a free scrap car removal service. We aren’t just scrap auto dismantlers! You can enjoy our free junk vehicle pickup service without needing to pay a single dollar, and end up with much more money. And don’t worry about what condition your vehicle is in. Sure, a car that is in worse condition will have less parts on it worth salvaging, making it worth less money. However, we do pay more money for vehicles than anyone else, and the maximum amount is $12’000. And not one single cent of it will be lost to the removal of your broken car. Thus, cars aren’t the soul automobile out there. There are other types of vehicle. There are trucks, Utes, vans, SUV’s, and even 4×4’s. And these vehicles break down just the same. If you have any one of these vehicles, you don’t want to be left out of the party. You want to be able to get top dollar too. That is just one of the reasons why we also buy commercial automobiles. Trucks are a lot bigger than cars, so if you have a truck to get rid of, be sure that it will get more money than a car would. This is due to the amount of weight in metals that are found in a truck. Also, the maximum we pay for trucks is $15’000. Do you own a truck that needs to be scrapped professionally? Contact us and get the best deal for it! What Do We Do With your Scrap Vehicle? We don’t just pay top cash for your car. A lot of people think that we just crush cars into blocks and then throw them into landfills. This isn’t the case at all. We are professional automobile recyclers. This means that we are salvaging the car’s parts for use again in the future. We take the whole automobile to pieces. The parts and components that are in good condition and can be re-used safely are then added to our used part stock. Parts that can’t be re-used will have their materials recycled. The remaining shell is then shredded and magnets are used to separate the metal from the other materials. We sell the materials to companies that can use them or further recycle them some more. We pay the best scrap car prices in NSW, Australia. The cash for cars landscape is well populated. However, finding a company who will buy your specific make of vehicle can be hard. A lot of them focus their attentions on the top few most popular makes. This leaves a lot of people out in the rain. We want to ensure that all the people who need to sell their scrap vehicles can do so, no matter what the make happens to be. It is important to us that the maximum amount of people get to take advantage of our superior services. Also, we will not reject your vehicle for any reason. It can be absolutely any make and we will offer the best possible deal. Japanese: Toyota, Mazda, Nissan, Mitsubishi, Subaru, Honda, Isuzu, Suzuki. Korean: Hyundai, Kia, Daewoo and SsangYong. American: Jeep, Ford, Chrysler, Chevy. Or any other place in Sydney. We will come over and pay you the best possible deal on the spot. Get yourself a free quote. All you need to do in order to get a free, no obligations quote from us is call us up at the phone number mentioned above. Or you can visit our website. The main page has a quote request form on it that is simple and easy to fill out. We will get back in touch with you with a free quote as soon as possible. Finally, are you scrapping your car in Sydney, sell it to us, your friendly neighbourhood scrap car buyer, and get top cash!